I recently bought some Noodlers Ink. 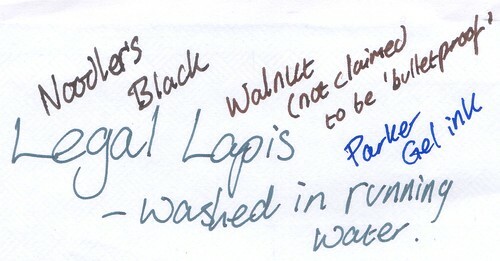 I got Noodlers Black and Walnut from the UK, and I ordered some Legal Lapis from the USA. I decided to test the waterfastness of the inks for myself, using Parker gel ink for comparison. As you can see, the walnut has lost some colour, but is passable. 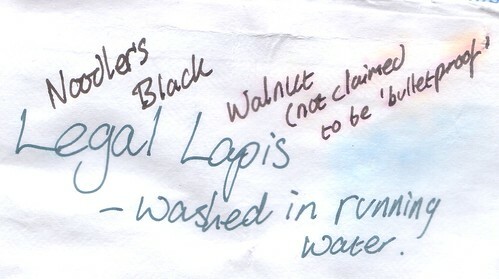 Black and Legal Lapis are untouched (despite being water based inks, and so fountain pen safe. The Parker Gel ink has all but vanished.